September was a month of birthdays in my family and I do bake at least a cake to celebrate all occasions at once. Chocolate being the most favorable flavor, I don't think twice what to make. But this time, we were super busy with some cultural functions in our community and I decided to cheat and made an ice cream box cake instead of a well decorated cake. It is not very pretty looking cake, but the flavor combo clicked very well in my family. My birthday also falls in September and I usually don't bake a cake for myself, but I got to cut a jello cake which was a surprise from my friend during one of our practice sessions for the cultural program. Kids and adults who gathered around me and sang happy birthday which made be blush like a little girl. It’s so funny that when you are young, you wish you get older and as you pass 30, you wish the birthdays come slower. On the bright side you can treat yourself as wiser and experienced as you age. Anyways age is a number, you cannot help getting older, but you don't have to get OLD. Keep your mind unwrinkled and be positive! 1 1/2 cup - vanilla ice cream thawed enough to spread. Line a loaf pan with plastic wrap with enough overhang on all four sides. Slice the chocolate cake into half in the middle. Place the cake in the loaf pan. Spread the thawed Vanilla ice cream on top of the cake. 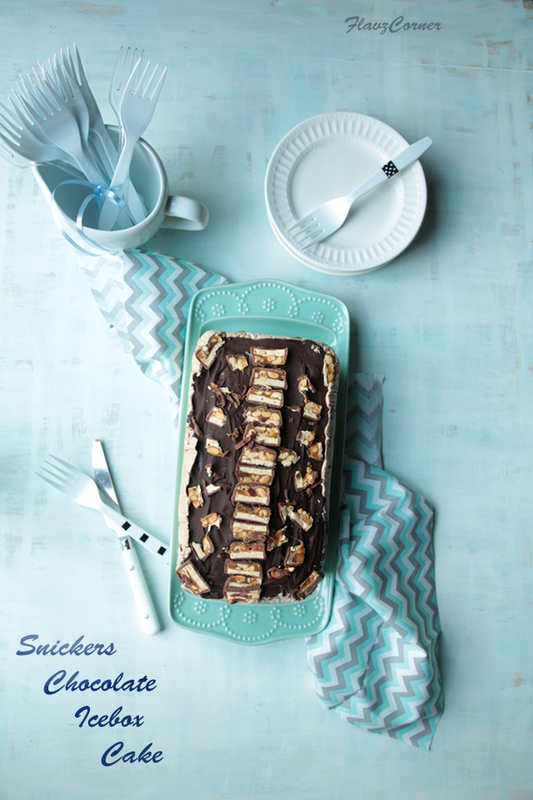 Now top the vanilla ice cream layer with the sliced snickers and freeze for 30 minutes. Place the second piece of chocolate cake on top of it and gentle press down; cover and put it back into the freezer. Whip the heavy cream on high till soft peaks are formed. Add the powdered sugar and vanilla extract, melted chocolate and whip for 20 seconds. Spread it over the cake layer and freeze for 2 hrs. 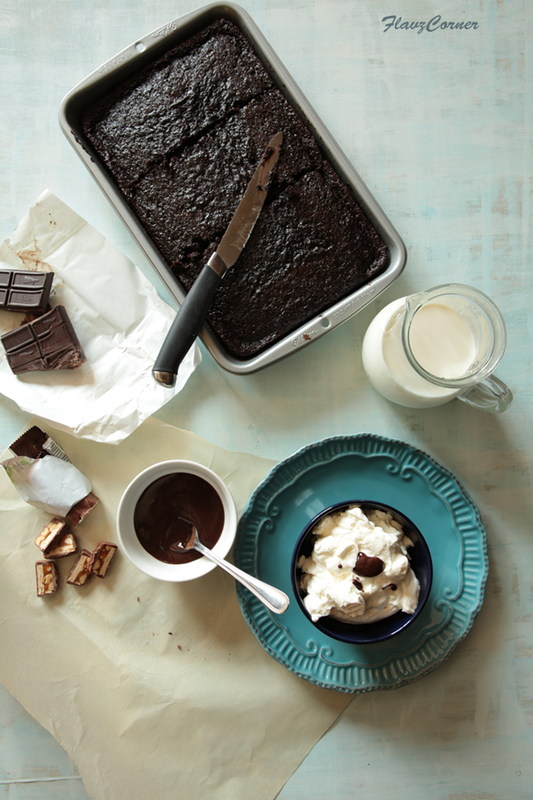 Pour the melted chocolate on top of the frozen cake in any pattern you wish. Sprinkle chopped snickers on top. Cover and freeze the cake for at least 4 - 8 hrs. Use a serrated knife to cut the frozen cake and enjoy. 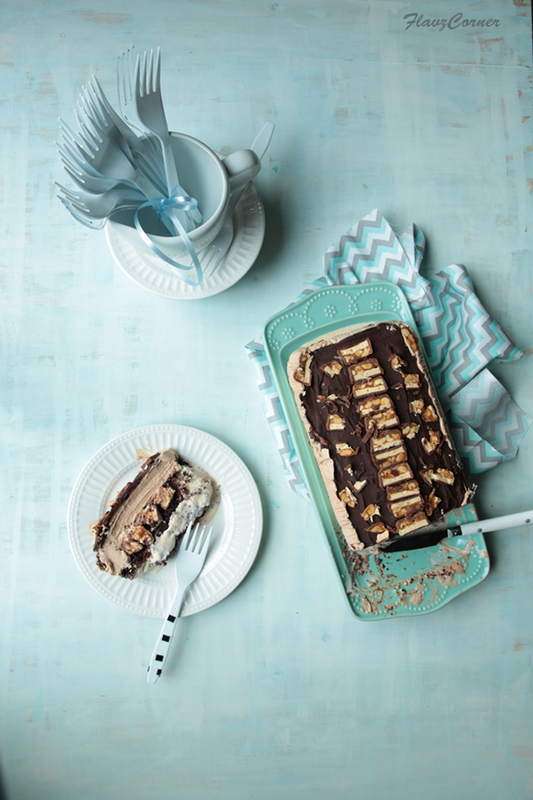 You can layer the cakes, ice cream and snickers in any way you wish. If you freeze the cake after putting each layer, you can see the layers better when you cut. I didn't freeze the vanilla layer, so mine didn't show the vanilla ice cream layer good as it oozed out to the sides when I pushed the cake layer on top of it. You can use 1 - 2 cups of melted chocolate to top the cake to get a better finished look. I used only 1 cup though. Cake looks super delicious with whipped cream,ice cream, snicker bites and the yummy chocolate layer..am sure kids might have enjoyed !!! I totally agree with you... as we age, birthdays are nothing. Hehe... 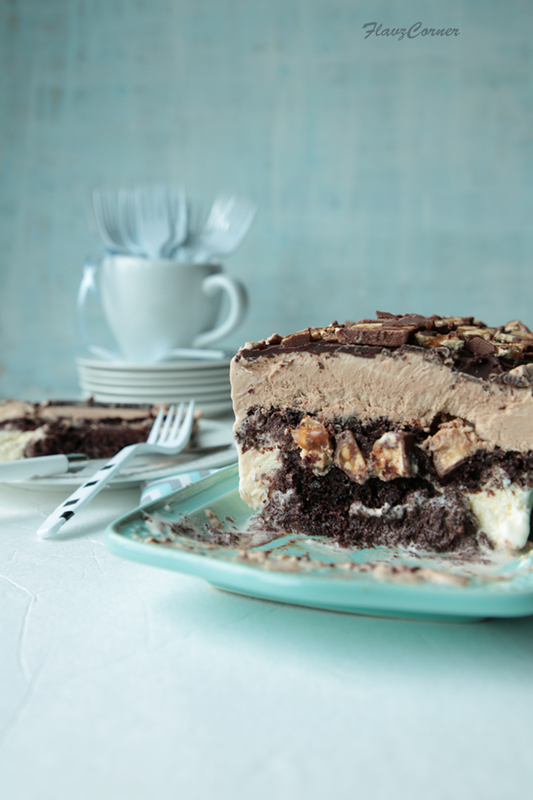 I love this ice box cake... with my favorite chocolate, Snickers... who wouldn't like to be treated with a big slice of it! This looks extremely rich and tempting! Happy Belated Birthday! Alas, time seems to speed up as we get older so the birthdays come even faster. :-) Anyway, what a terrific looking cake -- I couldn't resist. Nor would I want to! Really good -- thanks. Belated wishes dear Shibi! The cake looks utterly beautiful and so is the picture composition. This looks absolutely fantastic and so festive.